The redesign creates a luxurious feel by blending sleek lines, classic materials, and transitional fixtures. The wall-mounted Finial tub fixture by Kohler has a traditional silhouette that contrasts with the volcanic limestone bath by Victoria + Albert, a space-saving 60-inch tub designed for city living. 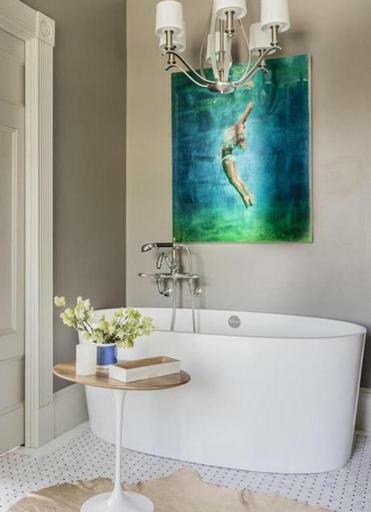 Tall ceilings allowed for both artwork — Deep Angel II by Eric Zener, from Lanoue Gallery in SoWa — and the chandelier, a transitional-style fixture by Hinkley. 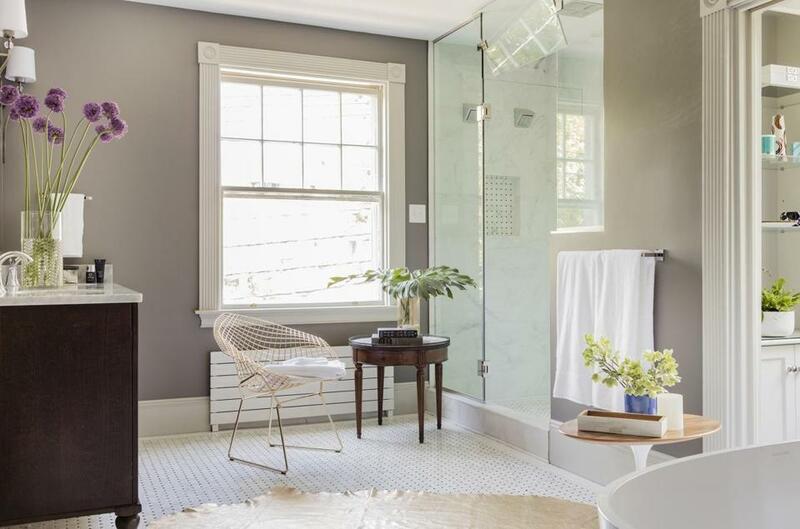 FOR INTERIOR DESIGNER Eric Haydel, taking on a stalled bathroom renovation in a Dorchester Victorian meant more than devising a floor plan and choosing finishes. He aimed to restore his client’s faith in the design industry. The new bathroom is light and airy but respects the home’s roots. The glass-encased shower and oval tub are crisply modern, while the basket-weave tile floor sports a solid white border characteristic of Victorian design. The dark-wood vanity would fit right in elsewhere in the house. Rich accessories, such as the gold metallic hide rug and painting of a swimmer, add an unexpected air that nods to the Victorian fondness for whimsy. Haydel preserved detailed moldings and mixed a brushed-nickel chandelier with polished-nickel faucets for a curated feel. The spa-like two-person shower boasts four large showerheads on the walls and an overhead rain shower. Homeowner Charlie Brown requested a Carrara marble basket-weave floor with black marble insets inspired by traditional New England hotels and French bistros. For the walls, designer Eric Haydel chose Sherwin-Williams Useful Gray, a midtone purple-brown that lets both the dark vanity and white millwork stand out.